Rating: 3 out of 5 Stars. The Kracken has been released. 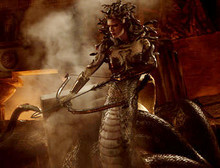 Let us now ponder the merits of this latest remake, an epic adventure plucked from the early days of stop-motion animation, when the monsters of Greek mythology were crudely animated puppets and moved with an unconvincing lack of fluidity. Louis Leterrier’s slick, CGI-driven production, transferred to 3-D as a post-production afterthought (and it shows), is generally faithful to the legendary Ray Harryhausen’s 1981 original, even poking respectful fun at that movie’s goofier inventions (Remember the mechanical owl?). It’s silly, overblown, and thoroughly disposable, a fitting tribute to its cinematic roots. That’s intended as a compliment, albeit slightly backhanded. 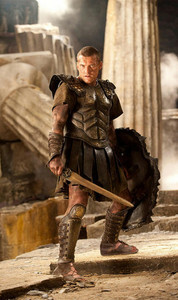 The new Clash of the Titans, starring Sam Worthington (Avatar) as Perseus, the demigod destined to save mankind from the wrath of the Olympians, is not likely to be confused with art. But if the idea of men in tight-fitting tunics battling hideous underworld beasts strikes your fancy, you could do worse. Those beasts include giant scorpions, sprung from the boiling black blood of Hades himself; the serpentine Medusa, whose dreaded gaze turns flesh to stone; and, of course, the Kracken, a sea monster of towering size and unsurpassed strength. Cerberus, the three-headed hound who guards the gates of hell, is noticeably absent. It falls to Perseus and his mortal followers (led by Mads Mikkelsen, of Casino Royale) to defeat them all, and to brave a treacherous journey across the River Styx en route to a showdown with Hades (Ralph Fiennes), the ghoulish brother of Zeus (Liam Neeson). Displeased by the insolence of his mortal creations, Zeus has sanctioned a strike against humanity. Hades, who feeds on fear for strength, is eager to lead the charge. The movie is not without a sense of humor, or an appreciation of camp. Both are indispensable when it comes to material like this. Nobody is going to see Clash of the Titans for its dialogue, which is numbingly pedestrian, or the depth of its characters, who fall into two categories: noble and despicable. Still, the casting is sound. Neeson, comically bathed in ethereal light as he surveys the chaos unfolding beneath the clouds, is a natural in the stern, godlike patriarch role, while Worthington plays his half-mortal son with a knowing wink, lending an otherwise one-dimensional hero a refreshing sense of fun (Remember, it's only the fate of mankind at stake.). And Fiennes seems to be channeling the same sinister spirit and complementary icy hiss he has brought to the Harry Potter franchise. 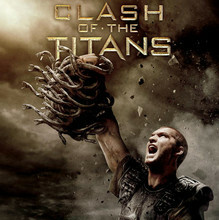 Even taken purely as spectacle, Clash of the Titans is less than breathtaking. Yet that, too, is part of its quirky charm, its less-than-special effects suggesting the simplicity of an earlier day, and its cheesy melodrama quaintly but agreeably over the top. It has no aspirations to be anything more than the popcorn movie it is, and for those amiably disposed to the genre, that should be enough.